In 1999, the Brainerd Lakes Chamber of Commerce and Brainerd Lakes Area Economic Development Corporation (BLAEDC) held a leadership conference for local community leaders. They looked at the challenges of their Internet capacity and decided they needed more bandwidth. At about the same time, another group of county and town leaders came to the same conclusion – although they were focused on the need for broadband for the schools. In 2001, the school took the lead in an unusual way; they levied for funding for schools and technology. They worked with local telephone provider Consolidated Telecommunications Company (CTC) on a plan to extend broadband to the community as well. As CTC deployed fiber, they laid strands for the school and strands for general use through CTC. Then the schools worked to get public entities connected; CTC worked to connect private companies. That effort built a bedrock for better broadband, and the effort is ongoing. The County has received support through ARRA grants and Minnesota Border-to-Border grants to deploy fiber to outskirts of the county. Getting broadband is only half of the job. Project partners (the school district, Chamber and BLADEC) have been focused on getting their constituents to use broadband, focusing on business improvements with broadband. In 2016, Brainerd got funding from the Blandin Foundation to work on a Tech Talent Recruiter program to help build local technology skills and promote Brainerd as a tech-ready community. Crow Wing County also received Blandin Foundation support through their partnership with the Resilient Region, which led to classes for local businesses, an effort to recruit tech companies to the area, and computers for youth at risk. The chart above tracks percentage of served population in Crow Wing County over time. You can see the steady rise of broadband, especially starting in 2014, but the county needs to prepare for 2026 goals. Before 2015, the broadband speed goal was 10-20 Mbps down and 5-10 Mbps up. Now the goal is 25 Mbps down and 3 Mbps up (25/3) by 2022 and 100/20 by 2026. The final point on the chart tracks progress toward the 2026 goal in 2016. Learn more. How is Crow Wing County Doing? Brainerd is the county seat of Crow Wing County. Sheila Haverkamp, executive director of BLAEDC explains the power of broadband, “For the last decade, our fiber optic network has been an important factor in helping start-up companies grow and succeed here. And now we’re getting noticed from others throughout the state.” House prices are up, median income is up and Brainerd is getting noticed. We met with representatives from Crow Wing County at the Chamber BLAEDC location in a room sponsored by CTC with $30-40,000 in technology and Gig access at our fingertips. It’s the same room community members meet in to learn how to better use technology. It’s a community that despite not having a four-year college is focused on better lifelong education. After a factory closing a few years ago, the community decided that technology would be their new industry. They train community members to use technology better, and recruit outside technologists with the lure of the lakes. The Chamber offers a range of online marketing classes for businesses. They try to be specific and practical in the classes, serving everyone from medical centers to resorts. After implementing what they learned, one attendee selling underwater cameras attributed $1 million to attending the class. Aside from the location, they needed to work on replacing lost jobs so they came up with an industry they call “tech services” for people who are using technology. They promoted the need, the training, and the availability of tech services. They now have 20 tech services companies that employ 1,000 people. They all need broadband. In 2014, the Governor’s Fishing Opener was held in the Brainerd Lakes Area. It’s a big opportunity for a community to promote local tourism and hospitality. Crow Wing County was able to take full advantage of the opportunity with mobile hotspots from CTC at the lake. It allowed everyone to selfie away on their favorite social media channel. 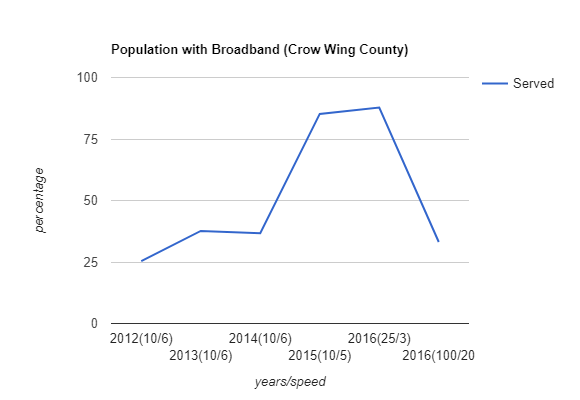 People come to Crow Wing looking for broadband. One millennial was moving to the area for a job but would only buy a home with internet access adequate for good gaming. BLADEC found him a home with a CTC connection. Brainerd had an employer that told them they needed 80 trained workers; if they couldn’t find them the company would have to leave. Brainerd doesn’t have a four-year college, but there is a community college. The local schools got an $18 million Department of Labor and Industry grant to develop and offer technology training, degrees and certificates in the school and for workforce development. Companies can stay and grow in the area. Because the residents have broadband, the county is able to provide services online. It’s cheaper and better. It means 24/7 access to information and transactions. The county answers questions online, they livestream (and archive) meetings, they use hosted software. Out of their $70M budget, $38M is in human capital. Investing in technology leverages the productivity of people. It helps squeeze ROI on labor. * Staff appreciate it because it allows them to focus on the public service realm versus answering rote questions repeatedly. Mark Prazak works for Microsoft. They have large number of employees that work remotely. He has a Gig at home; he was the second in town to get a Gig. (The first guy works for Apple!) Now that he has adequate access, his travel is reduced by a third. He used to travel a week a month. This year he’s traveled twice in 7 months. A week away costs roughly $2,000 in out-of-pocket expenses between flight, hotel, car, food, and a day of work. Mark would never buy a home that didn’t have a Gig. Going from 20Mbps to 100Mbps is like going from dialup to 20Mbps. Some large businesses require teleworkers to have a certain level of broadband to telecommute. *A study by SanDisk found slow Internet connections cost employees one week per year of productivity.